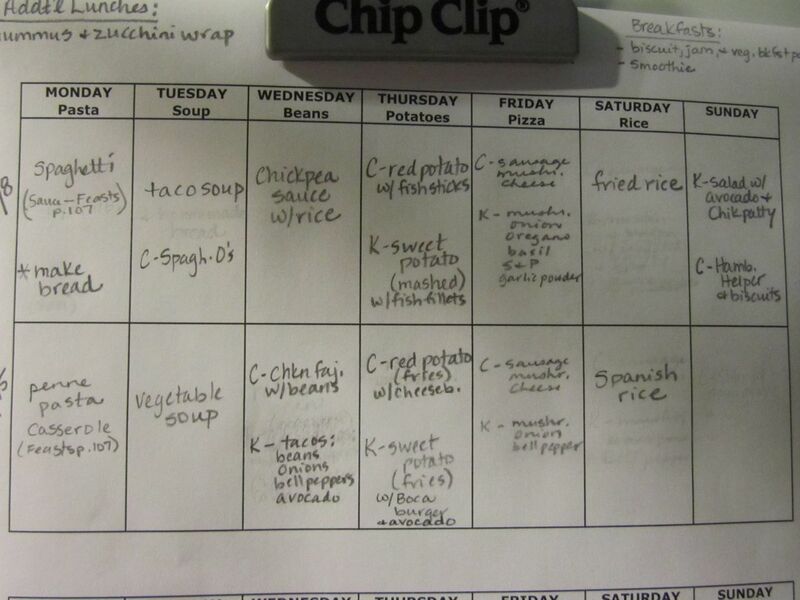 I tried having theme days for meals and planning two weeks of meals. Since I’ve gone back to work, cooking has not been happening. It’s gotten so bad, that we’ve found ourselves eating out or getting take away for breakfast, lunch, and dinner! Not good for the budget. So, it was time to rework the menu plan again. Luckily, we have a handy-dandy dry-erase board. I scratched out the days of the week and did away with the theme nights. 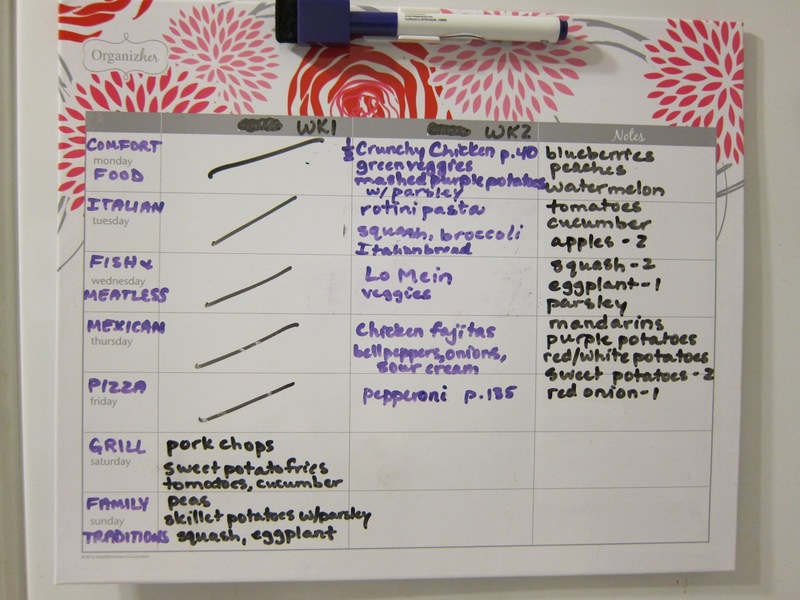 One column is for dinners and the middle column is for the next days’ lunches (note the arrows). Having a corresponding lunch helps me plan ahead for a different lunch item for days when dinners have no leftovers. The far right column shows items I need to use, freeze, or prepare. I plan to cook the dinners in any order I please. That way, if I feel so worn out after work that the only thing I can do is warm up taco soup from the freezer, then that’s what we’ll have for dinner that night. I tried to incorporate/plan meals using potatoes, rice, soups, items already prepared in the freezer, pasta, and produce from the local box that we need to prepare. I also tried to make all of the meal choices from foods that we have in the pantry or in the freezer, to cut back on the grocery bill. As we have tons and tons of potatoes, they will be served with as many meals as possible this week. Mostly, they’ll be thrown in the microwave and topped with butter, salt, and pepper. 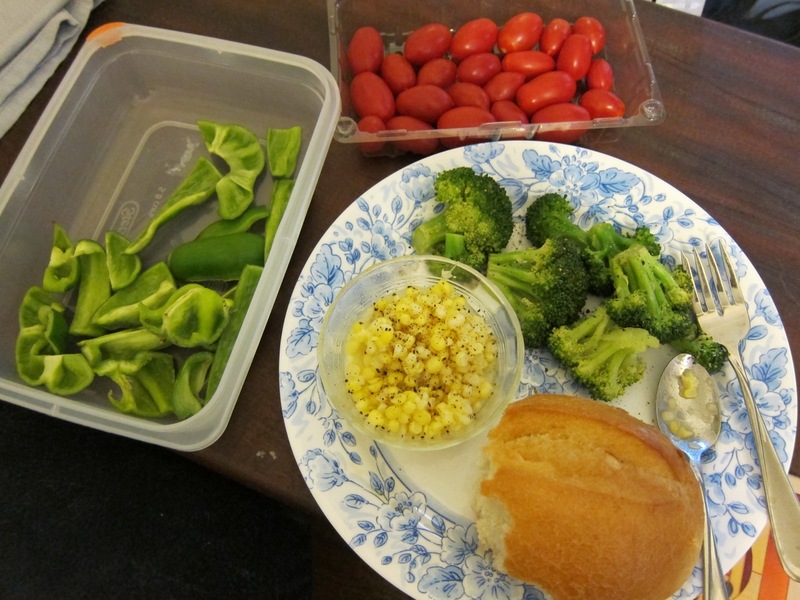 Here’s an example of a meal (lunch) using leftovers and items from our local box. I’m making good use of my magnetic dry-erase menu. I make changes quite often, but at least I’m trying to do a menu. I’ve gone ahead and shopped for any additional ingredients that I needed, so we have supplies for two weeks of planned dinners. Things could change with the contents of a local box, but at least we have a start. The menu items that say “Jaime” are from Jaimie’s Food Revolution cookbook. For Friday’s pizza, we’ll make the pizza dough recipe from The Food Nanny cookbook. The chicken fajitas are already cooked, sliced, and frozen, as we often buy the marinated meat in a large package, prepare it, and freeze it. Owl Haven and other sites have been making menus from their pantries lately, so I thought I’d give it a try. I like that The Food Nanny has you plan and shop for two weeks of meals at a time, but lately, our meals have been centered around our local boxes, which means that we plan meals once our local box has shown up. If we get fresh black-eyed peas, potatoes, eggplant, and squash, then that will take care of a couple of meals the next few days. Yes, you can look online to see what’s coming in the local box, but that doesn’t guarantee the quantity of a certain ingredient that you’ll receive, or the exact kind. For example, “assorted peppers” could be bell peppers or hot peppers. 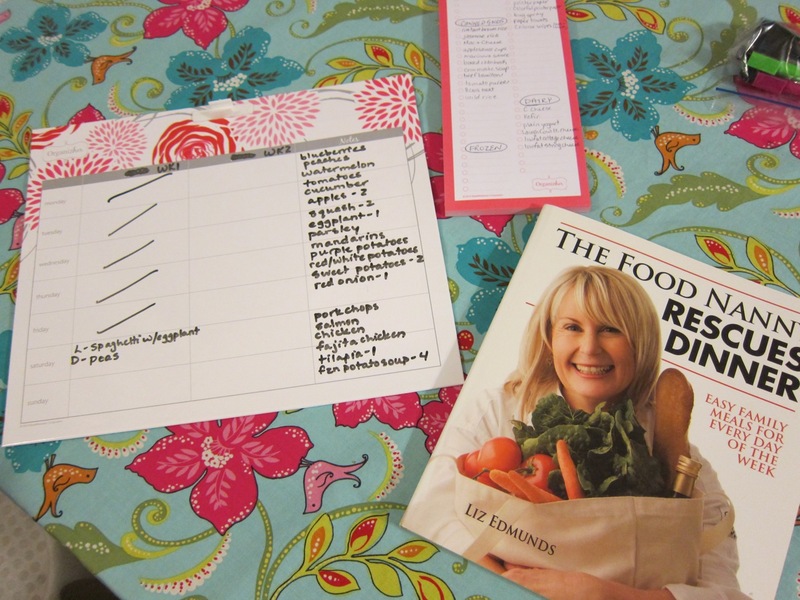 I’d like to be able to use meal planning ideas from The Food Nanny, so that I know ahead of time what will be for dinner, but I want my dinner plans to be flexible within a two-week planning period. I think that a having staples on hand (pasta, rice, etc. ), as well as planning a mixture of pantry meals (which I can purchase ingredients for, but not necessarily assign to a menu) should help us be able to do that. 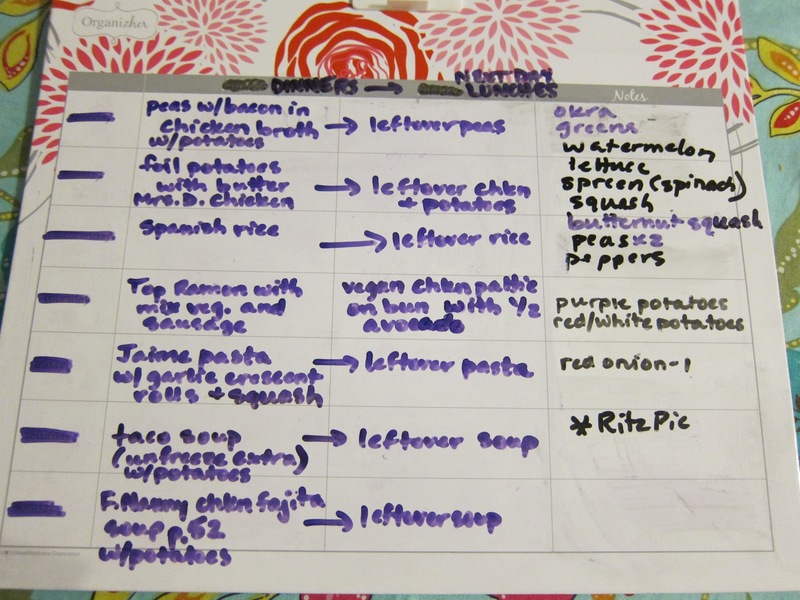 I started planning meals (paper and pencil) by making a list of the produce and leftovers that we needed to use up. Then, I made a list of meals and snacks that would go along with that list. As we used up items, I would cross them off the list. I found myself doing a lot of erasing to make room on the paper, as items were continually fluctuating: adding items from new local boxes, adding leftovers, etc. Thus, I needed a dry-erase board. I found this magnetic one from Target. It came with a magnetic notepad that you could use to write down your grocery list. So I started to plan a menu, and of course, it kept changing over the next day or so. I just couldn’t stay set on my menu choices. I’m so glad I got a dry-erase board. 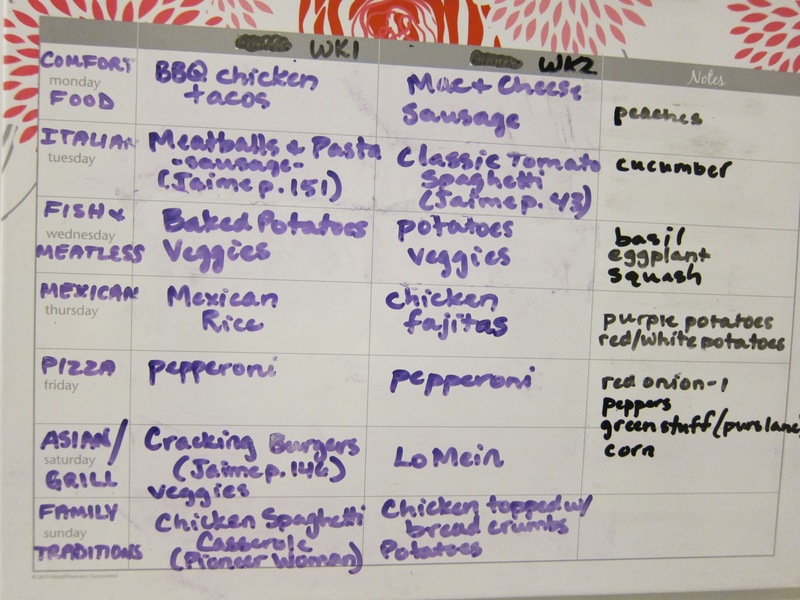 In the picture above, you can see the theme nights in purple on the left, two weeks (well, a little over one week) of dinners, and on the right, a list of produce that we need to use up. For dinner each night, I put additional veggies and fruit on the table, to help get it eaten. For example, I might put sliced cucumbers, snacking tomatoes, and sliced watermelon or sliced peaches on the table. I’ll eat the veggies, and my husband and I will both eat the fruit. How do I get my husband to eat the veggies from our local box? I’ve changed my menu since I’ve been eating more vegan meals. The above menu shows 2 weeks of dinners. Lunches are usually leftovers. Some days, my husband and I eat the same thing. He’ll just pull some meat out of the freezer to add to the dish. On other days, he does one thing and I do another. I try to make a monthly menu (or at least 2 weeks worth) and then go shopping for everything. That way, I only need to pick up fresh items (or snack that we’ve already finished off) each week. Up until I switched my eating to Vegetarian/Vegan meals, I had my October dinner menu planned. I had also purchased and prepped most of the ingredients I would need. It included cheeseburgers, meatballs, Mac & Cheese with turkey sausage, etc. My husband is a meat and potatoes person. I used to be, but now, I’m eating vegetarian/vegan meals. Thus, I’ve redone the menu. We’ll still have theme nights (thanks to The Food Nanny) with similar foods on most nights, but my husband will eat the foods that he enjoys, and I will eat vegan variations. For Monday Comfort Food Nights, my husband will have soup, Hamburger Helper with biscuits, Mac & Cheese with turkey sausage, etc. I’ll have veggie or bean soups, as well as other comforting vegan choices. I’ve got a recipe for a caramelized onion soup that I look forward to making. On Tuesdays, I have grad school out of town, so I’ll pack a sandwich, leftovers, etc. My sweet husband will have a cornucopia of choices from the freezer: homemade pizza, Jamie Oliver’s Food Revolution Cookbook hamburgers, chicken fajitas, etc. On Wednesdays, Italian Night, I listed spaghetti, but for me it says sauce and veggies, such as onions, carrots, and mushrooms. For my husband, he can alternate adding meatballs and breakfast sausage to the sauce each week. I have several jars of store brand pasta sauce, because it was inexpensive to purchase when I was buying ingredients for October. I looked at the ingredients of several store brands and realized that I didn’t like what I saw. I think when I run low on sauce, or when I have some free time, I’ll make and freeze a huge batch of marinara sauce. I used to make and freeze sauce a few years ago, so I can look for that recipe. I think it was from the Everyday Italian Cookbook. For Thursdays, Mexican Food Nights, my husband will have chicken fajitas, quesadillas, burritos, etc.. Mine will be sans cheese and chicken, with added veggies, beans, and rice. For Friday Pizza Nights, I’ll do veggie pizzas (I did one with black beans and red bell peppers the other night), and my husband will alternate breakfast sausage and turkey pepperoni. Saturdays are Grill Nights. We’ll stick with burgers for October. My husband will do cheeseburgers and I will alternate Morning Star Farms Chick’n patties with Grillers, veggie burgers that look like hamburgers. Sundays are Family Tradition Nights. My husband will do things like BBQ chicken quarters and potatoes. I’ll probably do beans and rice, or other vegan meals. I’m still looking to find more vegan/vegetarian recipes. I expect to make some changes to the menu throughout the month. Still, I want to begin the next month by having a menu planned with food for it ready to go. Work and school keep me very busy. When get home from work, I’m hungry for dinner. I prefer to have it ready in about 10 minutes, if possible. For that to happen, I need to have ready ingredients. I usually save longer-cooking items for weekends or evenings when I want to use cooking as a way to relax. I went to the store prepared to buy several pre-baked pizza crusts. I was very surprised to learn that they cost just under $5 each. I could get 4-5 Totinos pizzas for one pre-baked crust! A full, frozen pizza (of what some might term larger size and better quality than a Totinos) could be purchased for $3. As I am trying to make frugal purchases, I did not buy a pre-baked crust. I did purchase one refrigerated Pillsbury pizza dough canister, but I’m not looking forward to using it. You have to really stretch out the dough and play with it to get it to a decent size. You end up with a rectangular pizza, and the inside pieces are often floppy. Thus, you then have to cut the dough into four smaller rectangles, but this just adds to the work. This weekend, I have been filling my freezer with prepped meals. I will look into making some pizza pockets or pre-baking my own pizza crusts. My counter is currently beckoning me to get out my Silpat Mat and work with some dough. We’ll see. I wouldn’t be surprised if I came out of this weekend with kolaches, bagels, and pizza pockets!